Direct Lease Driver of the Month, Keith Allison, Ridgeland, Miss., has more than 21 years of experience as a professional household goods mover. Keith has a great driver rating. This is his sixth Driver of the Month award with the van line. Keith was also selected as Driver of the Year in 2006 and 2011. 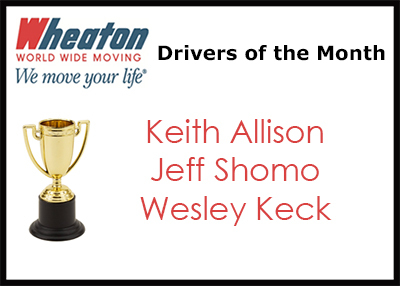 Jeff Shomo, DeVries Family Moving & Storage, Port Saint Lucie, Fla., earned Wheaton’s Permanent Fleet Driver of the Month award. Jeff is a veteran driver with more than 40 years of experience as a professional mover. This is his third Driver of the Month award. Wesley Keck, Bell Moving Systems, Burley, Idaho, earned Wheaton’s Intermittent Fleet Driver of the Month award. Wesely maintains a good performance rating and is a very reliable driver. This is his first Driver of the Month award with the van line.